Fig. 4: Detail of the map by Marcus Gerards dissected by means of DTD. Accessible through: Magis.kaartenhuisbrugge.be. Even before 1300, Bruges had a system of water mains. Together with Ypres and Damme, this town was exceptional in the Low Countries. The water mains of Bruges, known as moerbuizen (sing. moerbuis) have been identified archaeologically at many sites, but the system has also left remarkably many (medieval) written records. The publications by Vandevyvere, including the classic De Watervoorziening te Brugge van de 13e tot de 20ste eeuw, are essential reference works. The distribution network is shown on the map by Marcus Gerards. This bird's-eye view dates from 1562, and much later, in the 18th century or maybe even after, the course of the moerbuizen system was marked on the map sheets in reddish-brown (pencil?) lines. (fig. 1). Fig. 1: Detail of Marcus Gerard's bird's-eye view of Bruges (1562), accessible via magis.kaartenhuisbrugge.be. The reddish-brown lines mark the course of the moerbuizen. Also two wells are shown. 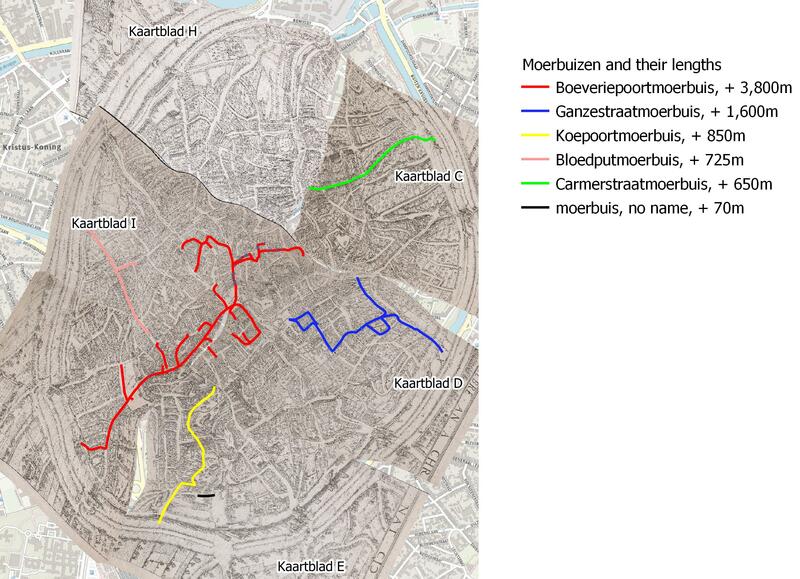 The map corroborates what is in the medieval written records: the water-mains system comprises five long main pipes which - following Vandevyvere - are shown in figure 2 as the Boeveriepoort, Carmerstraat, Ganzestraat, Koepoort and Bloedput moerbuizen. A short, sixth pipe appears on the map, which even to Vandevyvere remained anonymous. The Italian merchant Lodovico Guicardino, who visted Bruges in the late 16th century, was impressed by the water-distribution network. He described it as having 'limbs and branches similar to a tree' and seemed to believe that the underground pipes were present 'in all streets' and that in this way 'all the city' was provided with water. The system of moerbuizen certainly was on a large scale and ingenious. For instance, the Boeveriepoort moerbuis was almost 4 km long and the water was propelled through the tube by what the records refer to as an 'engien' installed in the 'old water house' at the head of the Boeveriepoort moerbuis. Subsequent history was to prove that the pipes might survive for centuries, but to state that they ran 'below all streets' is something of an exaggeration. Fig. 2: The courses of the moerbuizen as indicated in the 18th century or later on the map by Marcus Gerards (1562). Departing at right angles from the mains, some lines are drawn towards individual buildings. These are the house connections. These link up to almost every property in the Vlamingenstraat, but elsewhere in town are rarer. The written sources too refer to house connections: the moerbuizen register of 1404 records 33 domestic connections. One of the initiators of this register was Jan Foret. For over 20 years he was one of the managers of the moerbuizen network. One of the house connections was on the corner of the Zuidzandstraat and Hoogste van Brugge. At that time, the occupant was Jan Foret himself (Vandevyvere 1983 p. 80-81 and 125). An interesting point is that when we look at the map by Marcus Gerards, onto which centuries later the pipe system was drawn, a domestic connection is visible at the corner property in question (fig. 3). Fig. 3: Detail of the bird's-eye view by Marcus Gerards, showing the streets Zuidzandstraat and Hoogste van Brugge. Shown in red are the Boeverie moerbuis with two domestic connections. The map by Marcus Gerards has recently been digitally 'dissected'. (The result may be viewed on the website KaartenHuisBrugge.be , then select the option ‘MAGIS’.) This 'dissection' entailed the tracing of every element in the map, such as houses, windmills and wells. Since the study by Vannieuwenhuyze (2008), Brussel, de ontwikkeling van een middeleeuwse stedelijke ruimte, this method is known as Digital Thematic Deconstruction (DTD). In this way, the MAGIS website allows one to filter for e.g. 'wells'; then all wells will be highlighted (fig. 4). The result is brilliant and as yet unparallelled, but the researcher who seeks to know how many wells there were, and whether moerbuis pump wells were more numerous than source wells, still has to rely on old-fashioned counting. To answer such questions, the map has been processed in a different manner here. In a GIS program (QGIS), the wells were not traced, but the location was just marked with a spot. In the attribute table, various characteristics have been entered (moerbuis well, source water well, etc.). Admittedly, DTD-light does not produce as fine a map image as MAGIS, but it is relatively fast and offers a more sophisticated method of counting. Fig. 4: Detail of the map by Marcus Gerards dissected by means of Digital Thematic Deconstruction. Through the search screens the program has highlighted the wells in blue. Accessible through: Magis.kaartenhuisbrugge.be. Wells in Marcus Gerards' map are not recognisable by their sweeps, as they are in the birds'-eye views of Leiden, but by their stone-built housing (for instance, figure 1 shows two wells). Judging by these, 30 moerbuis wells are present in Bruges (intra muros). Of 3 wells appearing in map sheet H it was not possible to determine whether they connected with the Carmerstraat moerbuis: map sheet H lacks the reddish lines drawn on to mark the moerbuizen. Also the grey shade of map sheet H is different from the other map sheets; map sheet H seems to derive from a different set. What lies behind this difference is uncertain, but the upshot of it is that the course of the Carmerstraat moerbuis lacks at least several metres. Of the 30 moerbuis wells, 29 are situated on the public road. Moerbuis wells thus typically were public facilities. Often it is assumed that the groundwater at Bruges was too saline for deep wells, yet the map still shows 34 source wells. A quarter of these seem to be public facilities. Three quarters are not located in public spaces. This does not necessarily make them private wells; they may have belonged to monastic or other institutions. Fig. 5: The number of wells depicted on the map of Marcus Gerards (1562), divided into different categories. For this exercise, the map sheets by Marcus Gerards were georeferenced. That is to say: the well indicated on the Grote Markt square will, if overlain by a modern map, still be on the Grote Markt in the modern topographical situation (figs 2 and 5). Yet we should be careful, as reoreferencing of bird's-eye maps is not the most exact science. Nonetheless, this still rather global localisation does offer the fascinating possibility of comparing the 1562 situation with the ample topographical documentation of later date. And it is precisely this long-term comparison which - as we shall see in a future blog - will show that the 'medieval conditions' were far from bad. Vandevyvere, E., 1983: Watervoorzieningen te Brugge van de 13de tot de 20ste eeuw, Koninklijke Gidsenbond van Brugge en Westvlaanderen. Elien Vernackt (project worker with Magis Brugge, Musea Brugge / Archeologiemuseum Brugge), who georeferenced Marcus Gerards' map sheets. Deandra de Looff (University of Leiden) who laid the basis for the GIS thematic layer 'water supply'. © Roos van Oosten and Leiden Medievalists Blog, 2018. Unauthorised use and/or duplication of this material without express and written permission from this site’s author and/or owner is strictly prohibited. Excerpts and links may be used, provided that full and clear credit is given to Roos van Oosten and Leiden Medievalists Blog with appropriate and specific direction to the original content.